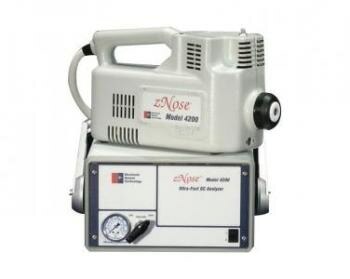 The Model 4200 Portable zNose® detects and analyzes all types of vapors. This portable odor analyzer identifies traces of organic, biological and chemical compounds with accuracy and speed. It uses an external computer that offers portable, accurate and efficient analysis. Model 4200 is a transportable system, designed to speciate and quantify the presence of organic compounds within a minute. It is powerful and capable of performing quantitative and qualitative odor analysis of almost any sort of vapor or odor with speed, accuracy and precision. It has the dynamic range of 2x10000 and its computer system runs any version of Microsoft Windows. It is accurate and efficient enough to carry 300 tests per day.